It doesn’t matter whether it’s a flock in Florida or a gobbler in Alabama, turkey hunting is a tough game sport. Many a hunter comes home empty handed when turkey is the target for the day. With this in mind, some turkey hunting tips can help give a bit of an edge for those about to embark on this most challenging of hunts. Hunting is an art itself that can be only be mastered by diligent practice. There are many institutes across the world that offer various courses to master the skills of hunting. Safety is the main factor to be kept in mind as we proceed further with this adventurous game. Hunting can be categorized under many types like big bird hunting, animal hunting etc but turkey hunting has gained popularity over a small period of time. Numerous hunting organizations are taking efforts to provide the new hunters as well as the ace hunters, with the latest tactics and tips about turkey hunting thus keeping the tradition of this game alive. Some of the best turkey hunting basics are nothing more than common sense. The fact is turkeys are pretty crafty game. They can see incredibly well and their sense of hearing isn’t all that bad either. Every little thing that can give hunters a leg up can really help make or break a day in the woods or at a field’s edge. Turkey hunting needs a good amount of walking, also one of the best forms of aerobic exercise. Turkey hunting is unlike duck hunting or deer hunting, where hunters are needed to sit still for long hours in a blind or a tree stand. Finding them before they find you. It is incredibly helpful to know where the birds in a particular flock go at different points during the day. A bit of advanced tracking can really pay off. If a feeding ground, watering hole or roosting area is found, a hunter can arrive and set up before the birds do. The wait-and-see approach can be a bit tedious, but it can pay off. Dress the part. Of all the turkey hunting tips, this might be the most important. Camouflaging everything from the feet up to the top of the head can really help a hunter avoid detection. Since a gobbler’s eyesight is so keen, doing this can really help with the element of surprise, which is absolutely needed in hunting. Rather than hiding under a heavy cover while hunting wear camouflaged clothing and try reducing your movements. 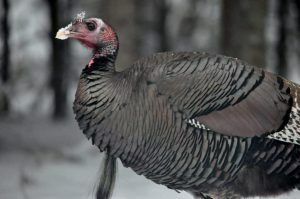 The colors of a wild turkey gobbler are blue, black, white and red. So avoid wearing these bright colors. The undershirts, pants and the socks should be long enough so that you can tuck them in the boots. Pick the right weapons. Whether it’s a shotgun or a bow, make sure they’ve been worked properly for hunting turkey. No other tips will pay off if the weapon isn’t calibrated to handle the job. For a bow, this might mean adjusting the pull so it can be held for a duration. For a shotgun, this needs selecting the right shot. The hunting gun should be camouflaged. Consider calls. This is another very important consideration as far as turkey hunting tips go. Often, it is better to get the birds to come into the hunter rather than vice versa. Calls take a little time to master, but they can pay off extremely well. While making the call it is necessary to camouflage your head and hands. It is important to choose the right spot i.e. rather than a thickly covered spot is is always better to choose a spot that is in open timber. Maintain a clear field of view when using a netting or a camouflage blind. According to reports, approximately more than 910,000 Americans die of cardiovascular disorders every year and numerous hunters could be at increased risk of a stroke or heart attack while in the field as turkey hunting is often physically exerting. It is also very important for a hunter to maintain a healthy diet. An ideal diet of a hunter should consist of vegetables, dairy products and fruits. Whole grain products and bread, poultry, protein foods, fish and meat can also be included in the A healthy diet consists of more than forty various nutrients. It is therefore necessary to take a complete diet without avoiding or skipping any single meal. Many of the cardiovascular training equipment have different modes that enable you to mimic numerous conditions that are there in nature like gradual inclines, mountain passes etc. Jogging or walking at the hunting spot in the prior week of the hunt season will help you in increasing your chances for success while actual hunt and also help you do much-needed scouting. Before beginning with the game, it is very important to learn and practice some turkey safety tips. Do not let your judgment cloud by any of the circumstances like the excitement of the hunt or peer pressure. Act responsible by obeying and supporting the laws of wildlife and by reporting the violations if any, to the authority. Turkey hunting tips cannot guarantee a catch, but they can really help. The key here is outsmarting the birds. This, however, isn’t as easy as it sounds. Be prepared for a challenge.